What’s in your spiritual handbag? As women, we carry all kinds of goodies in our handbag! But what’s in our spiritual handbag? 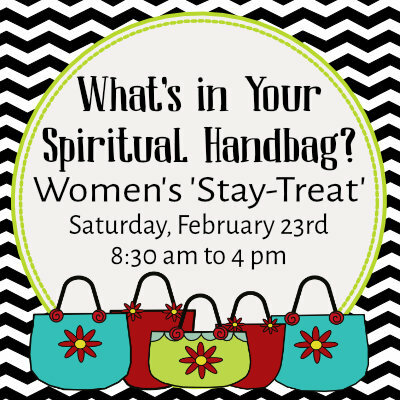 Through humor and the Word, we will explore the items we carry around with us in our spiritual handbag and the impact they have on our life! We’ll learn the tools that God wants us to have at our fingertips for VICTORY and create our spiritual handbag. Over the years many women have told us how much they treasure the annual Women’s Retreat and the experience of leaving the cares of life behind for a weekend of solid Bible teaching, life giving fellowship and soul restoring rest against the backdrop of beautiful Lake Tahoe. Just as many women have bemoaned the fact that because of health concerns, caring for family members, busy schedules, or financial considerations the Women’s Retreat has seemed inaccessible to them. This year the Women’s Retreat Committee is bringing to you a “Stay-Treat”. A “Stay-Treat” takes all of the fun, fellowship and great Bible teaching of our annual Women’s Retreat and condenses it into a one day event at the church that is do-able for women in all ages and stages of life. God has allowed Sherry to touch the lives of hundreds of women through conference speaking, teaching bible studies, writing, and mentoring. She is the author of Becoming a Woman of Character, and Becoming a Woman of Power with God. Sherry is co-owner of Christian Communicators, as well as a member of Christian Women in Media, Christian Women Alive and Advanced Writers and Speakers Association. Above all else, Sherry’s most valued role is that of wife to her husband John. Together, they are the founders of Bethesda Reno-Tahoe Ministry and John currently serves as Pastor of Restoration Church in Fernley, Nevada. The cost for the “Stay-Treat” is $25 which includes lunch, snacks, retreat materials & free time activities. Click here to use our secure online registration program. For off line registration please sign up on the info board at church or call the church office at 775-746-8118.